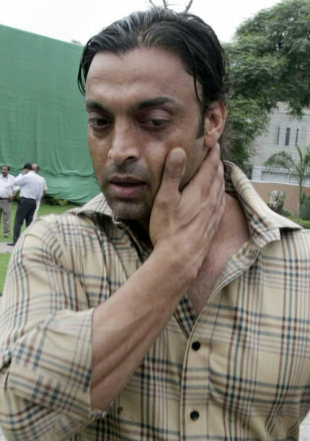 Shoaib Akhtar has not yet given up hope of reviving his dormant international career, believing that his return to domestic cricket for Khan Research Laboratories (KRL) might lead to a surprise international call-up. Shoaib's last appearance for Pakistan was last year, a wicketless outing in a Twenty20 international in Dubai against Australia. Since then fitness issues, the rise of Mohammad Aamer and the return of Mohammad Asif have eased him further out of national reckoning. He has not played a Test for Pakistan since December 2007. But Shoaib is leading KRL in the ongoing RBS one-day tournament in Pakistan in the absence of Mohammad Wasim and his team are placed second in their group currently. Shoaib has turned out in two games and has bowled just over 13 overs so far, for a solitary wicket. "My aim and goal is to win back my place in the Pakistan team and I strongly believe that I will be back," he told PakPassion.net. "You know things change very quickly in Pakistan cricket and I'm confident that my chance will come again. I can't say whether it will be the Twenty/20 World Cup or later in the summer in England, but I believe my chance will come." Pakistan's next assignment - after the two Twenty20s against England in Dubai - is the World Twenty20 in the Caribbean in April-May. Shoaib has missed the first two editions of the tournament, having been sent back from the inaugural tournament in South Africa in 2007 for a bust-up with Asif. He was not selected last year after the board made public an embarrassing skin ailment. Shoaib is planning to play in Pakistan's domestic Twenty20 tournament, due to begin on February 27, in a bid to remind selectors that he is still around. "I've been working really hard on getting match fit in the pre-tournament camp we held and am playing currently in the cup and have been feeling good," he said. "The most important thing is to get some cricket under my belt. We are unbeaten and second in the table with one game to play against Habib Bank." Shoaib has even held out hope of one day captaining Pakistan, one of the few big names to not have led the side at all over the last 12 years. "I've enjoyed the responsibility of captaining the boys [at KRL] and they have shown me great support. Captaincy is something that I really enjoy. "Captaining your country is the dream of every cricketer and I am no different. As a young boy when I first started playing cricket it was my dream to captain my country. I hope that one day I will be given that chance before I retire as it's still my dream to captain Pakistan." 0 Response for the "Shoaib still hopeful of international return"